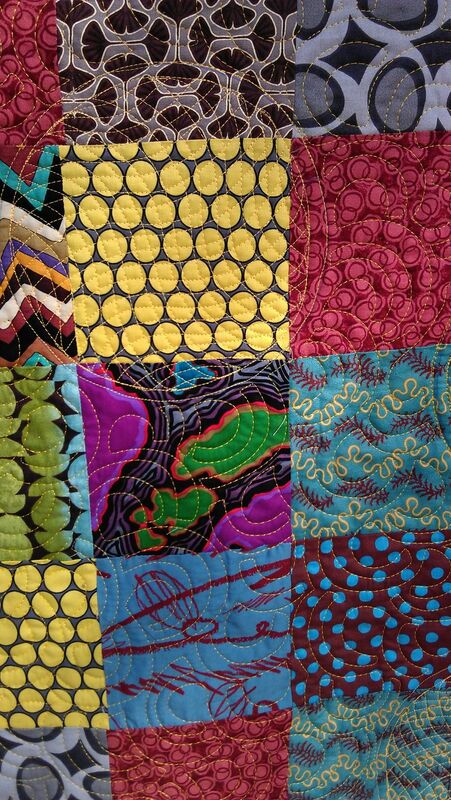 I was told when I picked up these Community Quilts for quilting that there was a ‘challenge’ quilt amongst them. I have a feeling this might have been it. Why? 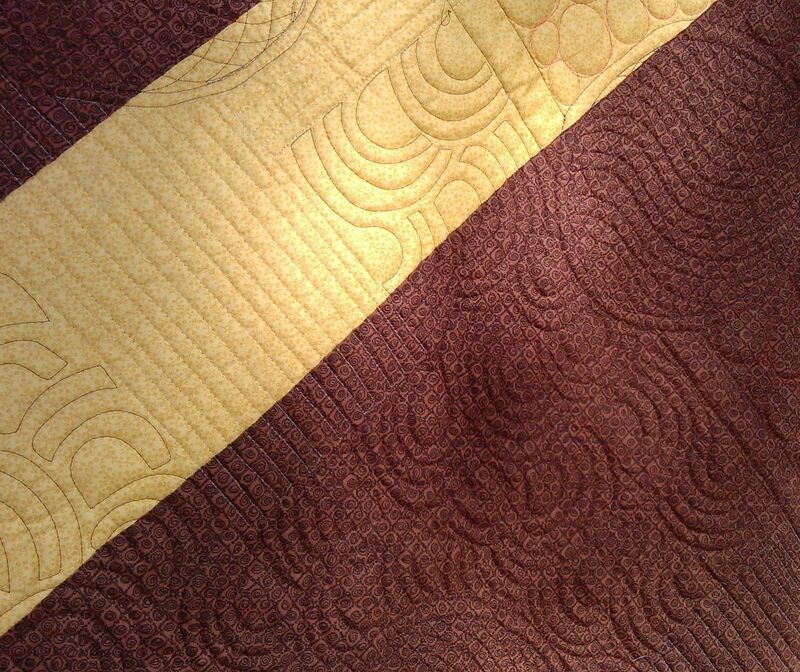 because someone had started quilting it (the long straight lines extending from the blocks into the borders) and had marked big circles randomly across the quilt, ready for quilting. 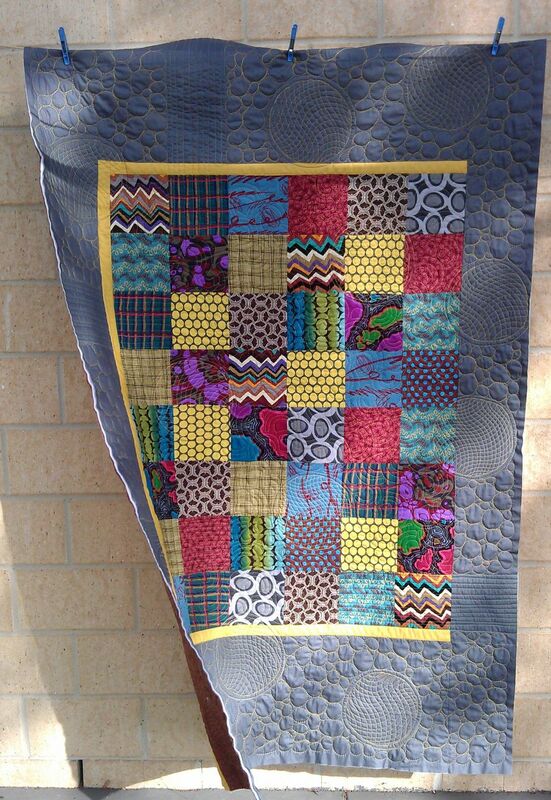 On pulling this one out of the bag, my first thought was to quilt it in yellow to set off the grey in the uneven width borders and to echo the yellow in the sashing strips (only on 3 sides). My second thought was to quilt the ‘white space’ in the borders with more circles (or pebbles or bubbles, or whatever you want to call them). I wasn’t quite sure what to do in the main top where the busy fabrics were. I started by stitching around each of the circles, then free motion stitching an echo circle about one quarter inch in from the marked circle I’d just stitched. Then I continued stitching a wavy matrix inside each circle, leaving the gap between the two lines of circle stitching to act as a slightly puffy border. Even though my inner circle line wasn’t always exact (i didn’t mark it or use a ruler), with the extra stitching I don’t think it matters too much. After I finished stitching all the circles and their centres, I had decided to do a simple all-over motif for the gaps between the circles in the very busy fabric of the main part of the quilt top. 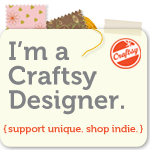 To echo the circular motif, I stitched a squared-off-end version of my ‘open headband‘ motif across all the open areas. And then I stitched circles/bubbles/pebbles in the open areas of the grey borders. I liked the overall effect, especially the yellow thread against the grey fabric. Bottom: Can’t remember, but likely a Wonderfil Invisifil (100 wt) in a dark brown thread. Like the yellow – enjoyed this one, Rhonda. Nice effect!!! 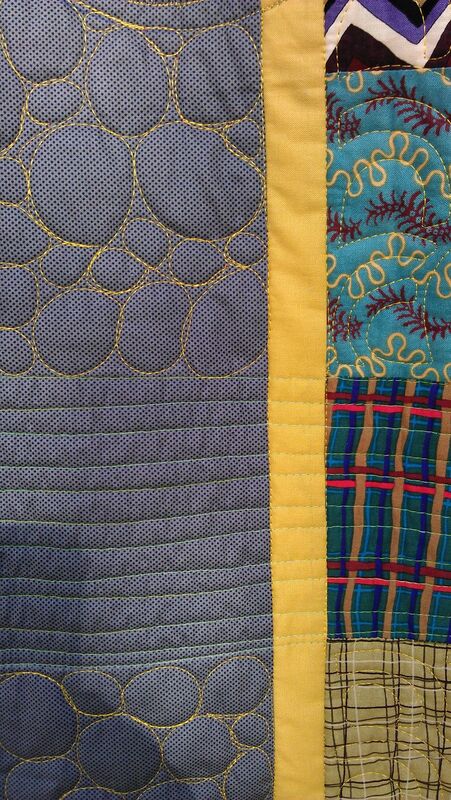 The overlap of the circles on the pieced center is very nice and softens the straighter seam/block lines. 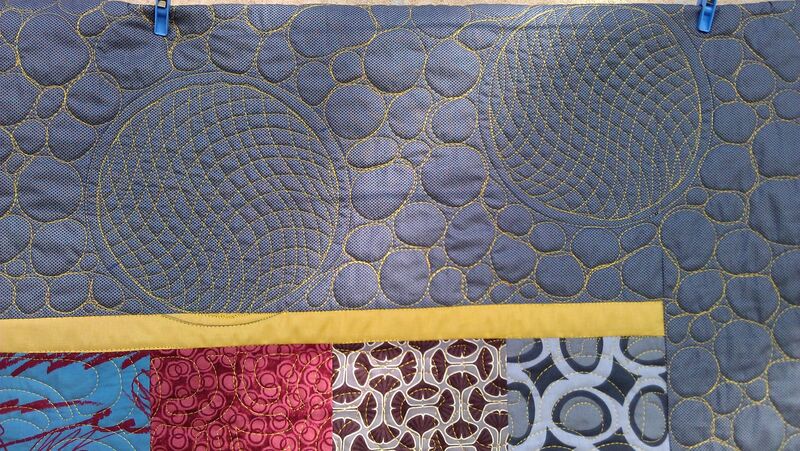 Love the entire quilting design itself. Really beautiful! That really inspires me to keep practicing. It came out great. The circular stitching adds a lot of movement to the squares, making it much more interesting. You certainly turned it into something wonderful!